FALMOUTH, Mass. – The 10th man is the player who often goes unnoticed. He goes about his business and plays the game, not seeking any recognition. He wears his heart on his sleeve and never gives up. You may not see him atop any statistical leader boards this season in the Cape League, but he’s the one who kept the team together throughout the summer. The 2006 Manny Robello 10th Player Award was presented to Andrew Walker (Texas Christian) of the Falmouth Commodores for his untiring determination – even when injuries looked like they would set him back. 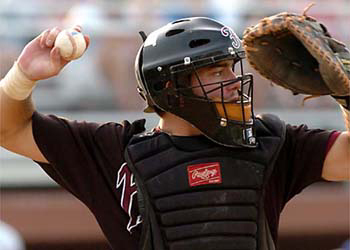 A catcher is often defined as one of the most essential position players. Dan Dunn, the assistant GM of the Falmouth Commodores, described Walker as just that. “[Walker] was the backbone of our team,” Dunn said. “He battled some injuries throughout the season but never let them hamper his playing ability. His grinding work ethic was an inspiration to the team. 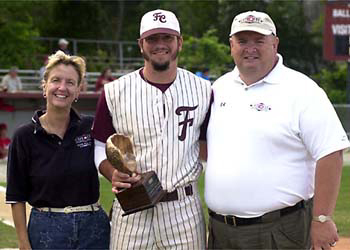 He often had clutch hits or would make a play when the team needed a boost.” Dunn compared his style of play to Cliff Pennington, the 2004 10th Player Award winner Pennington who also played for Falmouth. Walker faced lost time due two injuries during the summer, but he came back quickly enough to appear in 37 games. He broke a bat against his forearm against Brewster early in the year, and then he dislocated his middle finger against Hyannis. For this second injury, he was told he would be out ten days, but through hard work he came back after three. With recovering so quickly from these injuries Walker was also given the Iron Man Award by the Commodores. Walker will go back to TCU proud of his accomplishments this season in the Cape League. This summer for Falmouth, Walker put up a .271 average with 16 runs, two homers, and 19 RBIs. In 2006 for TCU, the right-handed sophomore boasted a .304 average with 36 runs, nine homers and 42 RBIs, good for second among his teammates. On hand for the presentation of Walker’s award were his parents, who were very proud of their son’s achievements. This also made the presentation very special for Walker himself. The award was presented by league president Judy Walden Scarafile and commissioner Paul Galop on August 5.